In the 1920s, American women were enthralled by the sophisticated designs that emerged from Europe. Europe, and in particular Paris, France, was the epicenter of all that represented fashion. Consumers were hungry for the latest styles both in clothing and jewelry. It was a time when American fashion industries, including jewelry manufacturers, all bustled to be the first to bring the designs back home to the American public. Women’s stores in New York were quick to advertise their new wares to feature the designs sponsored by, Patou, Chanel, Premet, and Schiaparelli. At her first reception, she entered in the style and fashion that she had come to be known: jersey, pearls and a bedazzling cuff of multi-color semi-precious stones. True to her European aesthetic, she was charming and bold, and contrary to today’s daytime jewelry fashion, she felt one should wear plenty of jewelry for daytime, and very little for formal evening wear. Ms. Chanel never strayed from speaking her mind, and was full of opinions she shared with the eager media audience who wrote down her every word—some which she is now quite famous for saying. • She did not think any one group set the fashion, neither was fashion confined to any one class. As progressive as MME Chanel was in the twenties, she displayed a bit of conservatism when she addressed the recent state of fashion in 1931. Surprisingly, she detested fashion “revolutions” and preferred the gradual evolution of design, further commenting that the recent state of skirts (lengths) were too high. Unfortunately Hollywood would not prove to be Chanel’s muse, nor she that for the actresses. Her designs did not stand up to the glamorous desires of the Hollywood’s film stars. • 1928: Colored Jewelry: Diamond-like 45 inch amethyst-colored crystal necklace set in sterling silver. • 1931: Jewelry with matching bag clasps made of galalith in shade of white, light pink and light blue. *Note: Costume was a common term to refer to a particular outfit or garment. 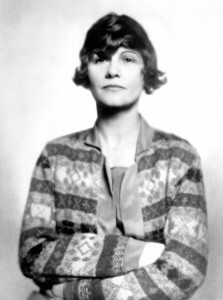 This article tells the story of Coco Chanel and her first visit to America.